Biography: Sailesh has 25 years of experience in creating successful new businesses and products. 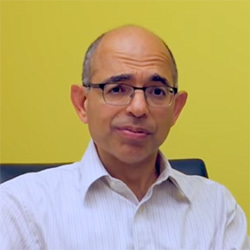 Prior to Mobisante, he managed $100m worth of exploratory research investments in emerging technologies to identify and seed new businesses at Microsoft. He also led the turnaround of the WebTV acquisition into a profitable business, launching multiple new product and services with revenues that peaked at $220m. He has had business and technical leadership roles in companies such as Hewlett-Packard, Oracle and Transarc – a startup acquired by IBM that became a billion dollar business. Sailesh has championed cell phone technologies in healthcare since 2005 and he co-authored the book, “Technology at the Margins” that takes a global view of the impact of the mobile phone on healthcare, education, micro-finance and resource management. Sailesh has a PhD from Ecole polytechnique fédérale de Lausanne, Switzerland, a Master’s degree from University of North Carolina, Chapel Hill, and a Bachelor in Technology from IIT, Kanpur in India, all in Computer Science.